Fad and starvation diets may work temporarily for weight loss, but once the diet is over you start to gain the weight right back again. Dr. Karas teaches his patients the healthy way to lose body fat which is what you are really after in weight management. 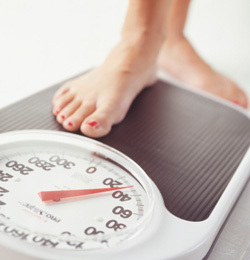 Our weight loss program is based upon two methodologies. This diet works by increasing calories to lose weight. The diet plan involves eating healthy foods 5-6 times a day. This boosts your metabolism by making your digestive system, which is smooth muscle, work all day digesting food. It also keeps you from getting hungry and stabilizes your energy throughout the day. Why does the Atkins diet work for some people and make other people sick? Because there are different metabolic types. Some people are fast oxidizers and some are slow. Some people are carbohydrate types and some are protein. If you are not eating the correct foods for your metabolic type you can be making yourself sick and will never lose weight. Dr. Karas evaluates each individual patient to determine their metabolic type as well as their thyroid and adrenal function. The patient is then given a diet plan for their specific needs to help lose weight and get healthier. Patients can lose a pound or more a week the healthy way. There are no expensive foods to buy that contain a list of ingredients you can’t pronounce. You shop for your own groceries and make your own meals. That way your entire family can enjoy getting healthier right along with you. Your progress is monitored every 2-4 weeks checking your weight, body mass index, body fat and body measurements. We also tailor an exercise program to the individual taking into consideration what they physically can and can’t do. We can help turn your body into a lean mean fat burning machine. For more information call the Chiropractic Health Center of Hamburg at (973) 827-8150.